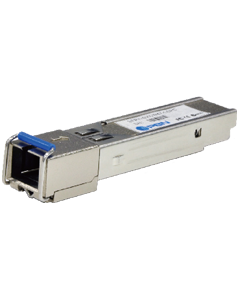 PBN’s EPON SFP transceivers are designed for medium-haul operations up to 20 km using a single-mode fiber. The transceivers feature a 1310 nm laser transmitter and a PIN photo-detector for highest reliability. The optical output can be disabled using either a TTL logic-high signal, or via the I2C bus. Transmitter-fault indication and loss-of-signal output indication are also provided, using discrete status lines. Digital diagnostics functions are also available through an I2C bus based on the popular SFP MSA to achieve highest vendor compatibility. (1) A (TX) + B (RX) = 280 mA (not including termination circuit). (2) Measured with light source (1310 nm or1490 nm), ER = 9 dB; BER =< 10^-12 @ PRBS = 2^7-1 NRZ. (3) When loss of signal is de-asserted, the RX data +/- output is the signal output.